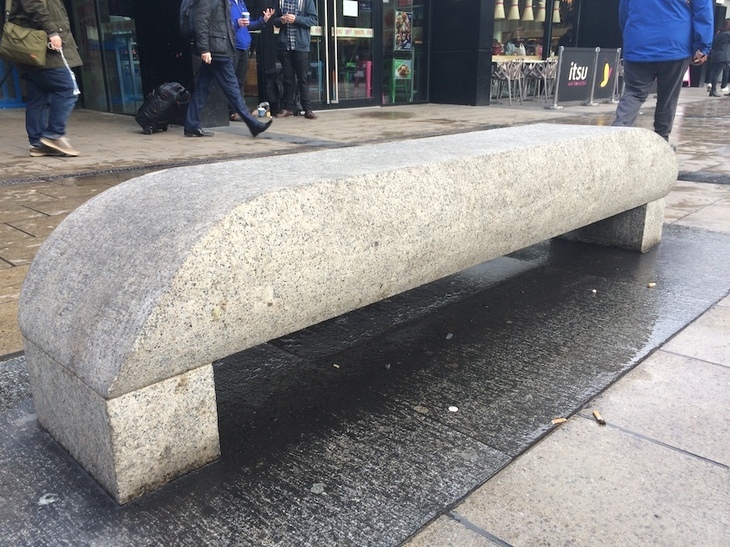 Have You Spotted The 450-Million-Year-Old Bench Outside Euston Station? 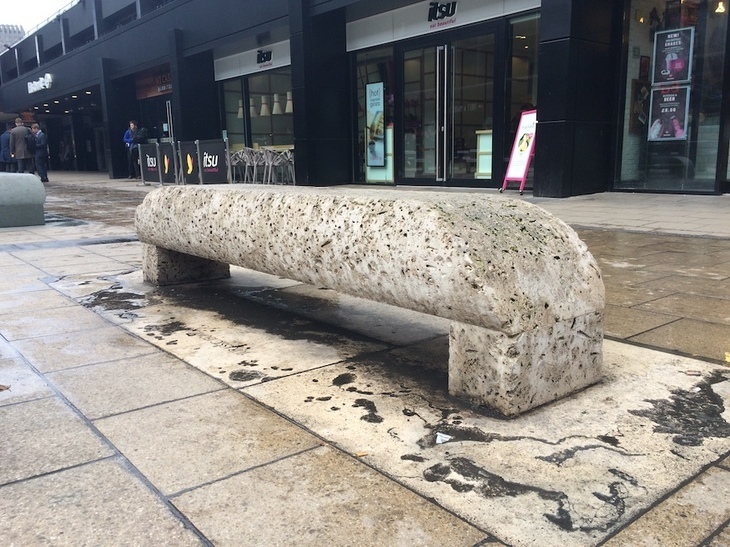 Zoe Craig Have You Spotted The 450-Million-Year-Old Bench Outside Euston Station? This bench is made of Elterwater Slate from Cumbria. 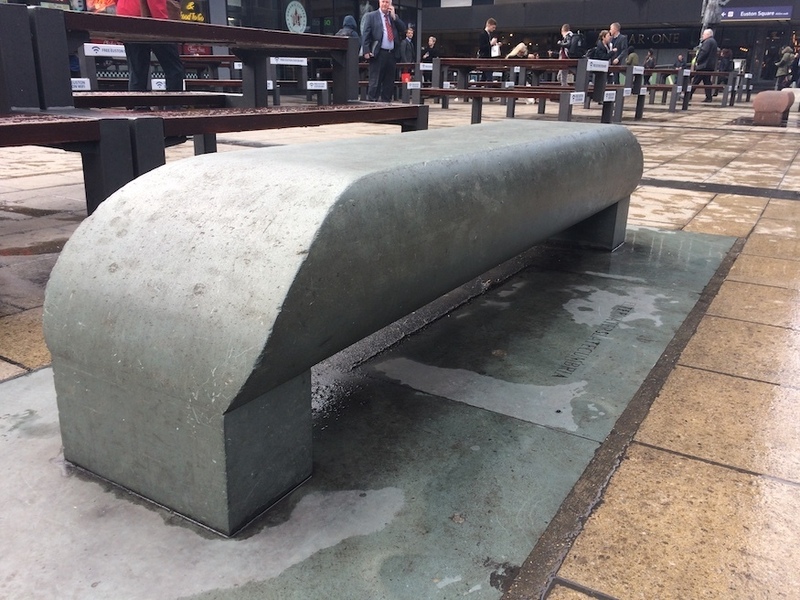 There are four unprepossessing, but rather special, benches outside Euston station. It's a classic example of remarkable art being hidden in plain sight. 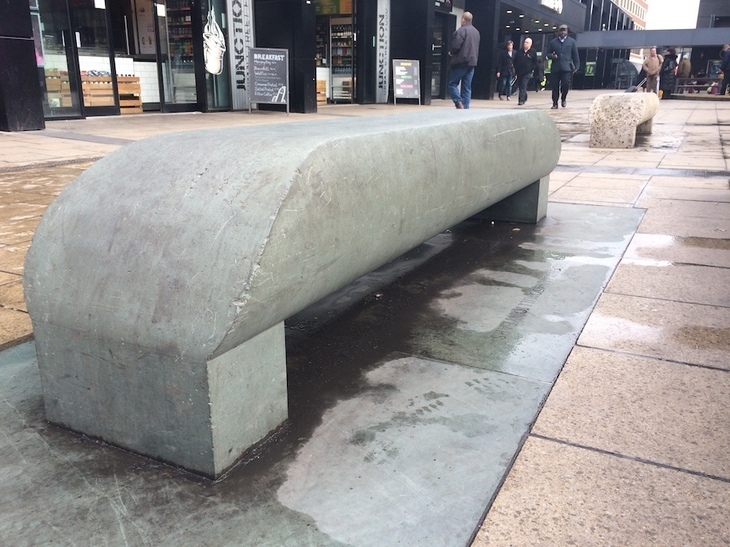 Created by sculptor Paul de Monchaux, the benches are made of materials spanning different geological time zones, hence the work's title, Time Benches. The pieces were originally made for the Gateshead Garden Festival in 1990, and were moved to outside Euston shortly afterwards. 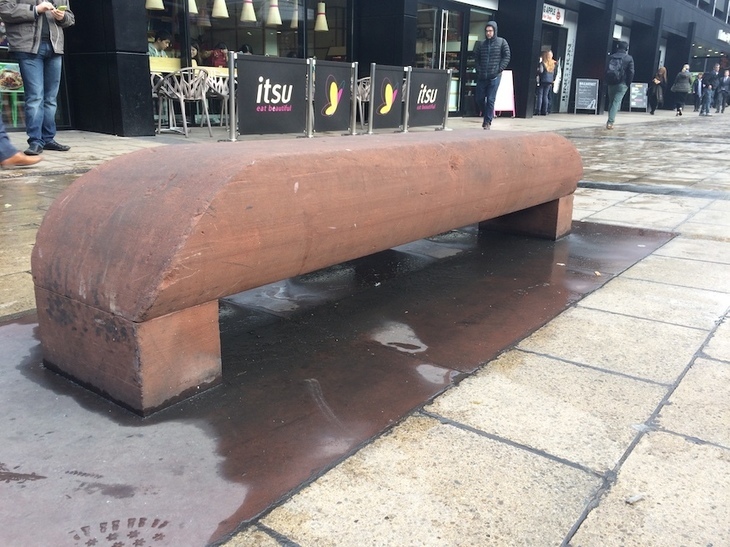 They're stunningly simple, the kind of structure kids balance along and jump off without a second thought; a useful (if a bit cold on your bum) resting spot while you're adding sugar to a takeaway coffee; or if you're rushing for a train, quiet pieces of street furniture that'll scarcely distract you from your journey. But take a closer look, and they're pretty fascinating. The labels below each bench give clues as to the status as artworks. They're made respectively from Merrivale granite from Dartmoor; sandstone from Cumbria; green slate from the Lake District; and Portland roach. Each bench stands on a base of the same stone, inscribed with the name, geological age and provenance of the stone used. To the west is the Merrivale granite, pale grey-brown, and the hardest of the four stones. It's about 280 million years old. 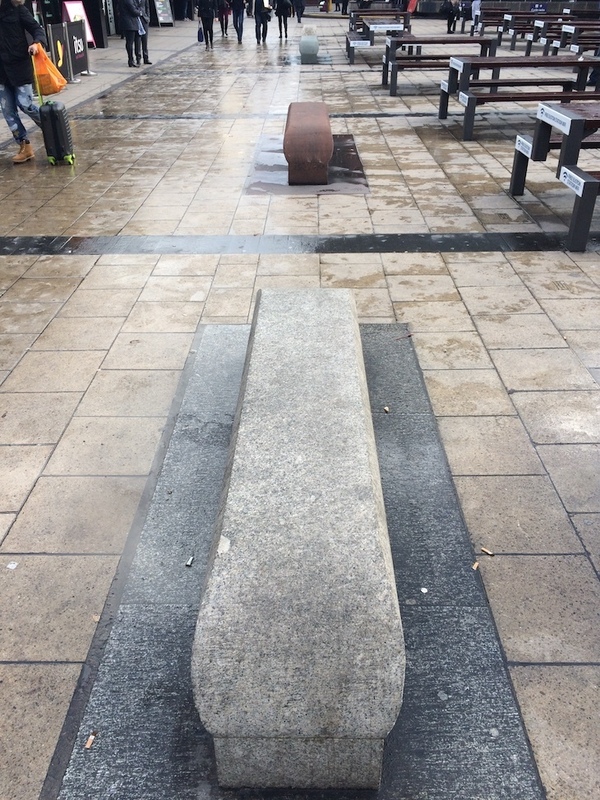 The first is a Merrivale Granite bench. The next Time Bench is a dark, red sandstone, quarried from St Bees near Whitehaven in Cumbria. This sandstone dates from the early Triassic period; during this time, around 250 million years ago, the UK would have been part of the super-continent Pangaea, and pretty much a desert. The red one is made from Cumbrian sandstone. 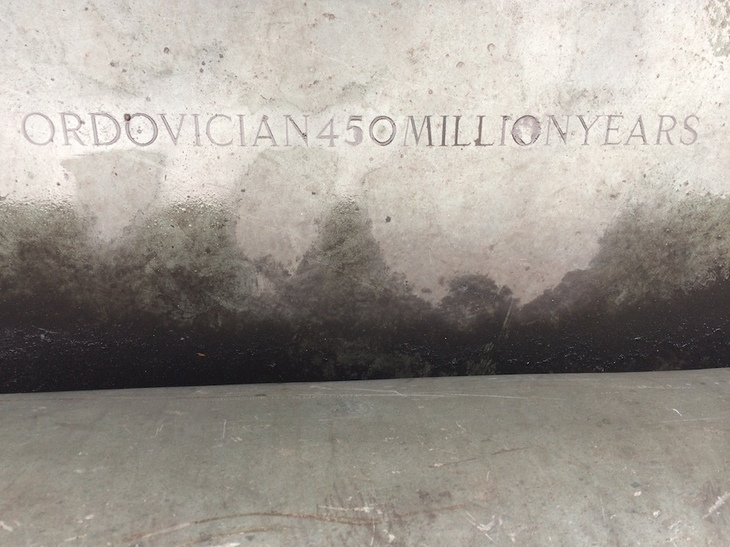 The third bench in the quartet is from the Lower Palaeozoic and the Ordovician: constructed from the green slate of the Lake District, it's around 450 million years old. This bench is made of Green Slate from the Lake District. The final bench in the foursome has, to our mind, the most unusual appearance. The fourth bench is made of Portland Roach. It's from this youngest bench we get the biggest giveaway something special's going on here. 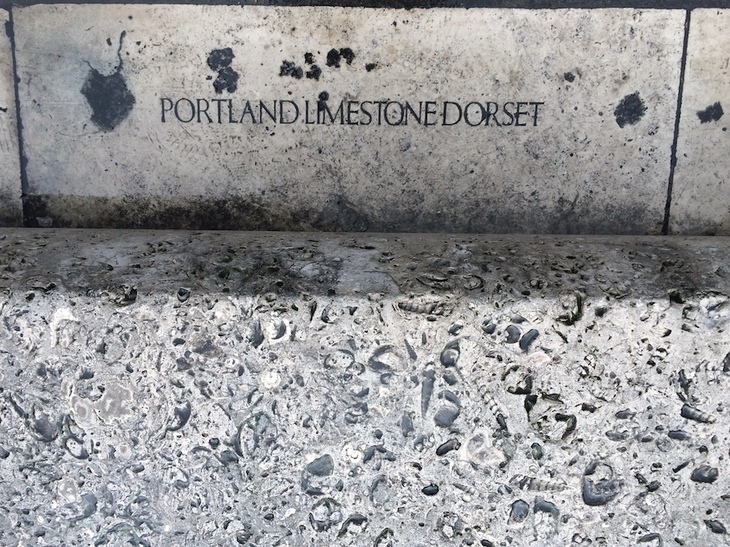 The 150-million-year-old Portland stone from the late Jurassic era is riddled with holes. Spot the incredible fossils in the stone. Look closely, and you'll see they're actually distinct forms; fossils, casts and moulds of shells that have been dissolved away over the centuries. With thanks to UCL expert Ruth Siddall, read more from her here. Images: author's own.